The best acoustic guitar strings for beginners are strings that will assist in making it easier to play the guitar and that will minimize finger soreness. This doesn’t mean that you have to go with nylon strings. There are certain types of steel strings that you can pick that will be well suited to the entry level guitarist. This post will cover three main things to look out for in your strings. But first let’s see if you should go nylon or not. 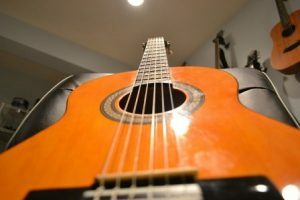 Some people recommend getting a classical guitar as a beginner as the nylon strings are easier to play – but if you don’t intend on playing the styles of music that the classical guitar is best suited to then this means you’ll have to buy another guitar soon. 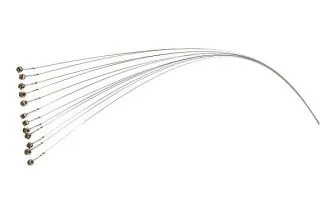 You can’t put steel strings on a nylon string guitar because a nylon string guitar (classical guitar) is not designed to handle the extra tension that is exerted by steel strings. You will damage the neck and bridge of your classical guitar if you do. You also can’t put nylon strings on a steel string acoustic. This is because nylon strings won’t exert enough pressure to drive the soundboard of an acoustic guitar. So if you want to play the styles of music that are best suited to steel string guitars (pop, rock, blues, bluegrass etc) then you should get a steel string guitar. There are a number of ways you can make your steel string acoustic easier to play (see below). If you are looking to get into classical, flamenco, folk (folk sometimes uses steel, sometimes nylon) and the likes then you should go with the nylon strings. If that’s the case, check out the post below on how to choose nylon guitar strings. If you are looking to play steel string acoustic read on. As I have mentioned there a few choices you can make to make steel strings easier to play when you first start out. It’s very important that your strings (and your guitar) are easy to play as a beginner. The easier it is to play, the more you play. The more you play, the better you get. Plus if the strings you are playing on are too difficult it will slow down your progression no matter how much you play. And the worst thing that could happen is that you end up not enjoying playing the guitar and give up all together. So, to help speed up your progression and make playing more enjoyable follow these easy tips. The gauge of string you get is probably the most important consideration for the beginner. This is because the lighter the gauge, the easier it is to press the string to the fret-board. This is because lighter gauge strings are under less tension than the heavier gauges. You can see the different gauges in the table below. Don’t go any heavier than ‘light’. If you are playing on a dreadnought shaped guitar (click here to learn more about guitar shapes) also don’t go any lighter than ‘light’ so you don’t affect the sound too much. If you are on a grand auditorium or concert guitar (see link above) then go with ‘extra-light’ as they will be the easiest to play on. Steel strings tend to have steel at the core but the bass strings have an extra material wound around them. This winding material comes in a few different materials. The most common are Bronze, Phosphor Bronze and Silk & Steel. The most common out of those three are Bronze and Phosphor bronze. However as a beginner you should start out with silk and steel. Why? Simple, they are easier on your fingers. All new guitarists will get finger soreness until they build up enough calluses. This can reduce the amount of time you play and put you off playing. Whilst any string you get is going to cause some sort of soreness (yes even nylon strings) silk and steel strings will minimize that soreness compared to the bronze varieties. Silk & Steel strings have steel as their core but are wrapped in either nylon, silk or copper that is silver plated and has silk running through it. This makes for a smooth playing experience and is easier on your fingers. There are of course many other options but these are some options to get you started. There are a few of different methods manufacturers use for winding guitar strings – roundwound (rounds), flatwound (flats) and semi-flatwound (semi-flats, a.k.a. flat-tops or halfwounds). Rounds are the most common type but aren’t necessarily the best for beginners. Flats have a flatter surface which makes them easier on the fingers so better suited to beginners. Flats also reduce the string noise that is created when your fingers slide across the strings. This can make it easier for the beginner to create a cleaner sound. Flats are harder to bend but this shouldn’t be something that a beginner is doing yet so this isn’t a problem. The biggest problem with flats is that they can sound a bit dead on most acoustic guitars. That’s where semi-flats come in. They have the same or at least similar benefits as flats but sound brighter. It’s also important to note that you probably won’t find any flats or semi-flats that are also silk and steel (see materials above) – not sure if anyone even makes them. This isn’t a problem though. Choose either silk & steel or semi-flats. You don’t need both. One more thing about semi-flats is that they tend to be more expensive than rounds. However, they are also more durable so that cost should even out, at least somewhat, in the long run. Hopefully you now know more about choosing the best strings for a beginner – whether that be you or someone you are researching for. In a lighter gauge string (‘light’ for a dreadnought and ‘extra-light’ for a Grand Auditorium or Concert guitar). If you want to learn how to put new strings on your guitar check out the link below. Thanks for reading. If you have any questions or comments please leave them in the comments section below and I will get back to you as soon as possible. Nate, This is great information. I tried to learn to play the guitar off and on through out my life but never stuck with it. One of the reasons is because of my finger hurting. I still have a fender acoustic guitar sitting in the closet, so I might have to get some new strings and give it another try. I had no idea that there were that many types of guitars. I just thought it was acoustic or electric. Thanks for the information. Great article. Hey Steve – glad you found the info helpful. Different strings can definitely make a big difference so you should def restring that Fender with some light gauge silk and steel or semi-flats and get playing again! This post is so helpful, obviously for the beginners. This is literally all you need to know to get started. I will definitely be coming back! Hey April – thanks for visiting. Glad it was helpful. Keep an eye out for my next post which will cover what the best acoustic guitar type is for beginners. My original string gauge 0.12 (Epiphone DR 100 VS) , but my finger pain and I plan to replace by gauge 0.10. to reduce finger pain. Yeah 0.10 gauge will make it nicer on your fingers for sure. Lighter gauge strings require less tension and when there is less tension you don’t need to push as hard to get a good sound – and as a result your fingers hurt less. That’s not to say that it will take the pain away altogether but should be lessened and if you persevere you’ll be building callouses in no-time and then you’ll be sweet. Thanks for visiting and let me know what you go with and how it turns out. Thanks for visiting. Glad that you found the guitar buying advice on the site helpful. Let me know what you end up going with for your second guitar. What was your first guitar – out of curiosity? Thanks for the input. I’ve never used these strings before but always good to have more options to try. Will have to give these a go at some point. Where can I find Medium/Light set of strings. Haven’t find anything on line. Medium-Light are sometimes called HD Light strings (I meant to put that with the asterix in there but I forgot! I’ll do it now :-). Check out the link below for some Medium-Light (aka HD Light) strings. Hope one of these are what you’re looking for. Thanks for your message. Appreciate it. I hope this helped you to find the guitar strings that you needed. Thanks for this review. I have been playing for a long time and use 13 – 56 gauge strings. My grandson is now taking up guitar and this info has been very helpful for me to help him with a easier introduction set up. Thanks for your message. I am glad this helped with your grandson’s guitar setup. Hope he loves playing the guitar! All good info. Same old story, my son bought his first acoustic and playing hurts his fingers. We will try semi-flat ones. Frets can be replaced – but if you don’t know what you’re doing, and most don’t, then you’ll need to get a professional to do it for you. I haven’t had it done so I’m not sure how much it would cost. It’s possible that they might also be able to grind down the existing frets – but again, this isn’t something that I’ve done before, so I think you’d need to see a professional (guitar tech, luthier) – probably asking at your local guitar store would be a good place to start.